There is more to a guided tour than information – you also need inspiration. This course will help curators teach and coach their docents and volunteers to create interpretive stories and experiences that will help make their presentations “come to life” for their visitors. 1. Have an interpretive theme. 3. 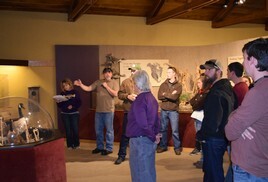 Has about 7 tour stops, each of which illustrate the main interpretive theme. 4. Use interpretive communications structure for each stop (provoke, relate and reveal). 5. Use the techniques of tangibles and intangibles in their presentation. 6. Encourage the use of multiple senses to relate to visitors. 7. Have a provocative introduction and then ending conclusion summary for the tour. 8. Have as much "inspiration" as "information". 9. Leave the visitors asking for more (when's your next tour? ).